Sierra County is a small county in the northern Sierra Nevada. It was created in 1852, out of territory in a then-much-larger Yuba County, it response to the pressures of the Gold Rush. Almost all the county is at elevations over 3000 feet, and more than half of it is east of the Sierran divide. Thus the county is mostly conifers (west) and sagebrush (east), with a few meadows and creeks. There is a single patch of montane chaparral in the southwest that has Wrentit. A famed birding spot at high elevation is around Yuba Pass, and the county includes the southern half or so of Sierra Valley. A few reservoirs here and there add to the mix. 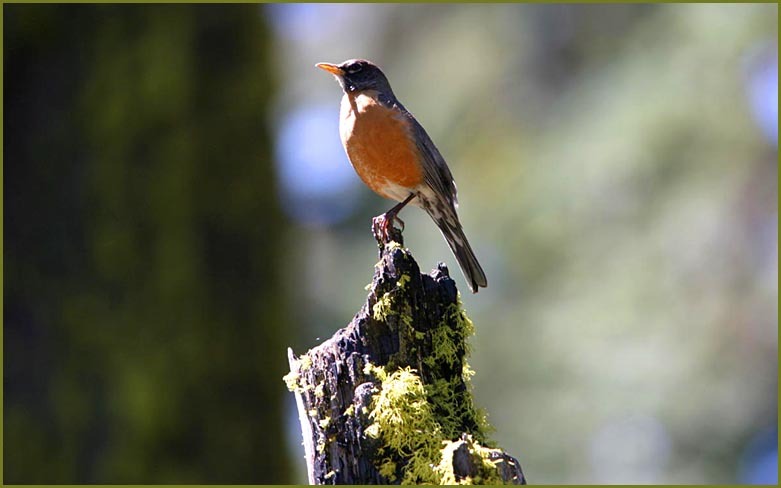 I only have one useable photo from Sierra County: an American Robin on an attractive tree stub. I actually have two other bird photos from Sierra County in my files, but they are marginal shots and duplicate birds featured from other counties (Common Loon, Northern Pygmy-Owl). My 'rule' is that once a bird is shown for one county, that species cannot be used for another county. Okay, I know its a stupid rule, but its my rule, and I'm sticking with it. Some day I'll go spend a few days at Yuba Pass and have a plethora. . . Speaking of Yuba Pass, the upper shot (below) shows it on a mid-summer's afternoon (22 June 2006). 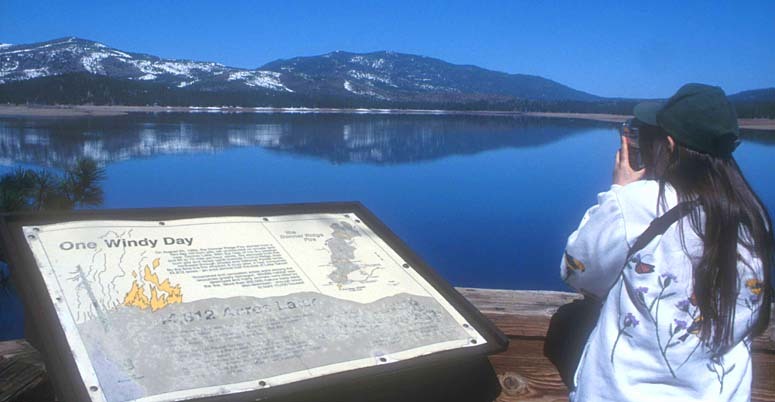 I also have a habitat shot (bottom) from eastern Sierra County: a view of Stampede Reservoir that shows the water and the burned area across the lake detailed in the sign (30 Mar 2002).